Welcome back to the #ToddlerApprovedTuesday weekly linky and community! I hope you all had amazing summers. We thought the summer was over up here in the North of England but this afternoon the sun showed up again and its boiling!! So what have you been getting up to this summer? 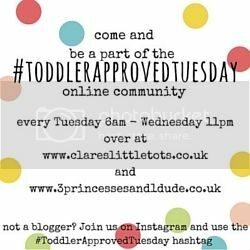 We’d love to see your posts in the link up below or share them on social media and don’t forget to use the #ToddlerApprovedTuesday hashtag so we can all see them. We’ve had lots of firsts this summer including a weekend in London with my eldest and her Grandma, a weekend camping in North Yorkshire with family and 2 weeks down south with my parents which included the first time away in their caravan in the New Forest. Somewhere in between those trips, walks, visits to the park and picnic lunches we’ve made these Paper Plate Sunshines, been Gruffalo Hunting, filled our tuff spot with bubbles and made the softest playdough ever!! Don’t forget to visit my co-host Becky over at 3 Princesses and 1 Dude! and see what they’ve been up to this summer.